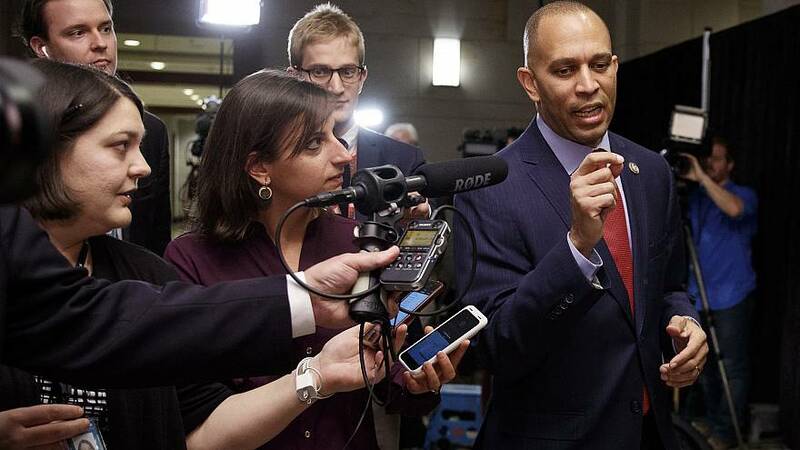 New York Rep. Hakeem Jeffries is standing by remarks he made Monday in which he called President Donald Trump "the Grand Wizard of 1600 Pennsylvania Avenue." In an interview Wednesday on CNN's "New Day," the House Democratic Caucus chairman said he had no regrets about the comment, which he made at a Martin Luther King Jr. Day event in New York City. "We've got to have an opportunity for at least one day a year to have a candid if sometimes uncomfortable conversation about race," Jeffries told CNN. "It seems to me that we can't have that conversation on Valentine's Day, we can't have that conversation on Saint Patrick's Day. It's perhaps appropriate for us to be able to have that difficult discussion on MLK Day, when we're celebrating the life and legacy of a champion for racial and social justice." Monday was not the first time Jeffries labeled Trump as such. But he told CNN that he "absolutely" does not think Trump is a Ku Klux Klan member. "Grand Wizard" is the title that was given to leaders of the white supremacist group. "I did not use the words racist in any of my comments," Jeffries said. "In fact, Wolf Blitzer in the past has asked me whether I believe the president is a racist, and I've consistently said no. I did use a colorful phrase, but of course I don't believe that the president is a card-carrying member of the KKK. But it did capture a troubling pattern of racially insensitive and outrageous, at times, behavior that spans not months, not years, but decades." As examples, Jeffries cited a Justice Department lawsuit against the Trumps in the 1970s for alleged housing discrimination, the president's remarks about the so-called Central Park Five, Trump's promotion of the false conspiracy theory that former President Barack Obama was not born in the United States, and the president's handling of the fatal violence at a white nationalist rally in Charlottesville, Virginia, last year. Jeffries wasn't the only Democratic leader to attack Trump's racial record over the Monday holiday. Sen. Bernie Sanders, a Vermont independent and potential 2020 Democratic presidential candidate, said at a Martin Luther King Jr. Day event in South Carolina: "It gives me no pleasure to tell you that we now have a president of the United States who is a racist." In response, Republican National Committee Chair Ronna McDaniel tweeted that Sanders' remark was "disgusting and wrong." "@realDonaldTrump has brought African American and Hispanic unemployment to record lows, passed historic criminal justice reform. Even worse that Bernie is using MLK Day to make an incendiary comment like that," McDaniel wrote.